These wings are kickin’ and a great appetizer recipe for any occasion, but go especially well with football games! 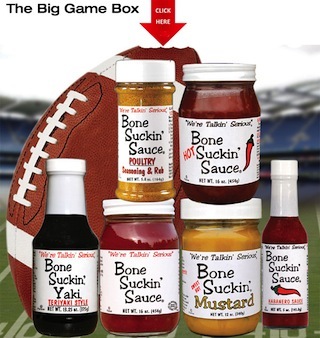 Bone Suckin’ Sweet Hot Mustard, 1 Tbsp. Water, 1/2 cup, plus 1 Tbsp. In small saucepan, sauté garlic, until it is golden brown, in 1 tablespoon of peanut oil. Add Bone Suckin’ Yaki Sauce, Bone Suckin’ Sweet Hot Mustard and Bone Suckin’ Habanero Sauce, Rice Vinegar and stir. In a small bowl, combine corn starch and 1 tablespoon of water, mix thoroughly, and add to sauce. Cook sauce at a simmer and stir. The sauce will thicken. Put chicken wings, GF rice flour, sea salt and pepper in resealable bag and shake, coating wings thoroughly. In a high sided skillet, add enough peanut oil to fill the skillet about 3/4 of an inch deep. Heat the oil to 325° and fry wings in batches until they are golden brown on each side. Remove wings and let drain on paper towels. To keep warm, set wings in oven at 200° until all wings have been fried. In simmering sauce, add parsley and stir. 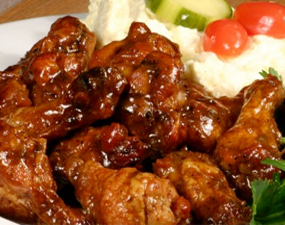 In a large bowl, place wings and pour 1/2 to 3/4 of the sauce over wings, turning with tongs to coat wings well. Place wings on platter and sprinkle with sliced scallions. Pour remaining sauce in a bowl for dipping. Recipe serves 6.